Cincinnati Bengals vs. Chicago Bears - NFL Preseason Feedback!! 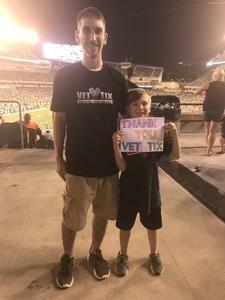 Thank you so much for donating the tickets for the Bengals and Chicago game. This was my sons first NFL experience and it was amazing. I can’t thank you enough for allowing others to have such a wonderful experience by being so generous donating. I hope that you truly know how thankful we are. My son is a “Bears” fan but, we will have to forgive him for that one as he was born there...lol. I was born and raised in Cincy so we rooted against each other in good fun...go Bengals!